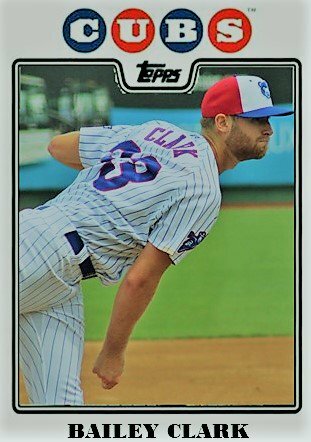 Prospect Update: Is This Bailey Clark’s Year? It’s not a secret that I have prospects I write more than others. Trevor Clifton is one, as was Eloy. I really enjoy writing about Jose Albertos and today’s prospect update subject, Bailey Clark. When he debuted for Eugene, I really liked what I saw that August in 2016. However, nagging injuries that offseason kept him getting his strength training in to get ready for 2017. I thought for sure he would begin 2017 at South Bend. Instead he was in Eugene until the last week of the season. For most of last year, he was magically frustrating. But in the middle of July last year, he began to get healthy and turn it on. This year, Clark made quick work of South Bend and is now at Myrtle Beach. Having been a starter for most of his Cubs’ career, the 2016 5th round pick out of Duke switched to the bullpen to begin the year. After spending the offseason weight training and settling into married life, Clark came out guns-a-blazing to begin 2018. He hit 95-96 on the gun with regularity and his 1-to-7 slider devastated both righties and lefties. For South Bend, he threw 14 innings over 5 games striking out 19 hitters. His 1.26 ERA earned him an All-Star nod for April on Cubs Central’s All-Star team. Bailey made a quick exit to Myrtle Beach near the end of April and assumed a piggyback-starter role for the Pelicans. Adjustments were to be made, as hitters are little more polished in the Carolina League. Somewhere in the third game, he kicked it into another gear. He looked vicious going after hitters while hitting 97-98 on the radar. He pitched backwards, in and out, up and down. Every batter he began to face looked very uncomfortable in the box. That night, on May 21, against Lynchburg, Bailey whiffed 6 batters in 3.1 innings. Bailey’s next appearance would be as a starter, replacing Jose Paulino in the rotation. He did fine. He went 4 strong, gave up 1 run and struck out three. He only threw 58 pitches. It is going to take some time to get his arm built back up to 80-90 pitches. For now, Bailey looks to be a starting pitcher for the near future. Then again, he looked comfortable as a reliever, too. 1. Confidence – He’s throwing any pitch in any count this year. That tells me he has faith to get a hitter out in a variety of ways. He’s throwing over 60% of his pitches for strikes this year. I’d like to see that higher, but where he is at is fine. 2. Ground Ball Rate – At South Bend, he averaged over 4 ground balls to 1 fly ball. At Myrtle Beach, his ratio is decent at 1.67. While he is getting a lot of Ks, he’s also getting a lot of worm burners as no one is really squaring him up. Over 50% of batters ground out against him. 3. Attack, Attack, Attack – He looks to be going right after guys this year. He’s not nibbling but is attacking the zone. He still walks a few, but he’s getting outs and stranding 72% of runners. He does need to lower his walk percentage, which is a touch over 5 at Myrtle Beach. However, taking what he is doing right now is fine. I am really looking forward to Bailey’s start tonight to see him get a lot of outs and to watch some more ugly swings against the slider.